SHOP DIRECT, we provide a huge range of parts and accessories for the care and repair of inflatable boats, tenders and RIBs. I am looking for antifoul for my Avon 4 mtr rib do you have the type that covers the hypalon. I have the type that covers fibreglass. Yes, Polymarine supply Antifoul for both Hypalon and PVC inflatable boats and RIBs. Visit our on-line shop: http://www.polymarineshop.com for details of all Paints and Antifoul. Can I use PVC cleats on my Avon hypalon inflatable? The cleats I bought previously from you and which have worked well were made of a softer more flexible material but I cannot find these on your website now. Hope you find what you need there as rubber to rubber (Hypalon) bond is the best option. 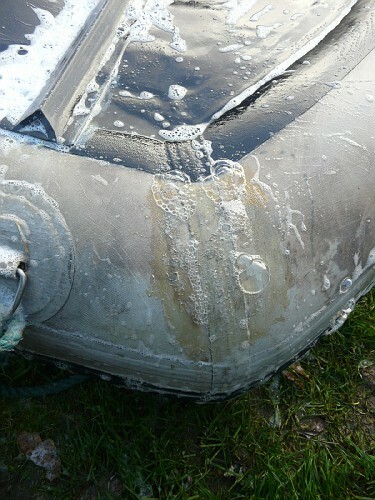 After many summers in the sun the rubber on our dinghy has perished and is incredibly tacky. We have used a dinghy and vinyl cleaner and polish, this made it a little better but within a few days it was back to being sticky again. Other than this the dinghy is in great condition. What can you recommend to fix this? Thank you for your enquiry. Sticky fabric caused by sunlight (UV ) is a common problem with pvc fabrics, which begin to break down – giving a sticky exterior. The problem cannot be cured by washing / cleaning. The problem can only be solved by covering the exterior. Our product “ Superflex” is a solvent based, fully flexible paint. The solvent in the paint, bonds the paint into the fabric surface, making the paint integral to the surface – not a covering. When the paint dries your problem is solved. The paint comes in a range of colours – black, grey, white, blue, navy blue, yellow and red. It can be brushed, rolled or sprayed. Coverage about 3 square metres per 500 ml can. I am not willing to redo the seam itself as looks risky; another idea is to put a larger piece of material on top – but would it hold? Also, what glue would you suggest for such operation?